We are still working on the patio spruce-up. 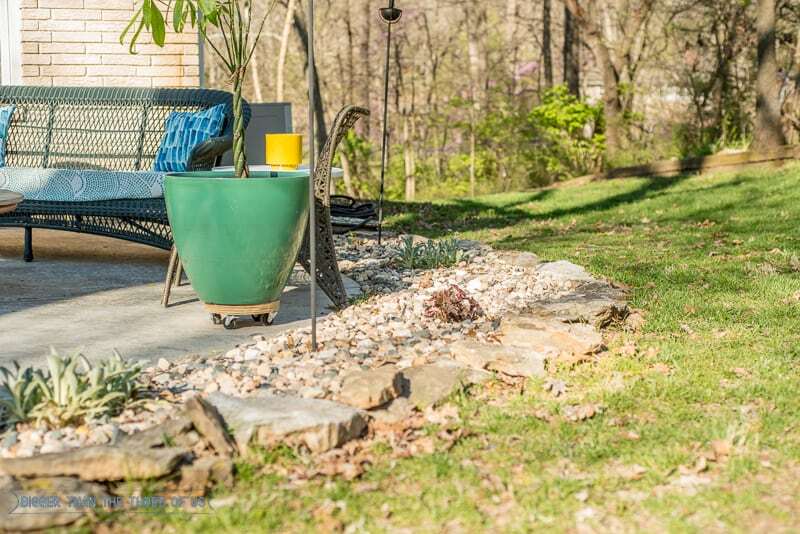 Today, we are talking about Landscaping with Rock instead of Mulch. If you missed the first installment of the patio spruce-up, or the DIY Scrap wood rolling planter, make sure to check those out! Or if you want to check out my recent shade garden update – you can find that here. Basically, we are working on sprucing up the patio over the next month or so… on a serious budget! 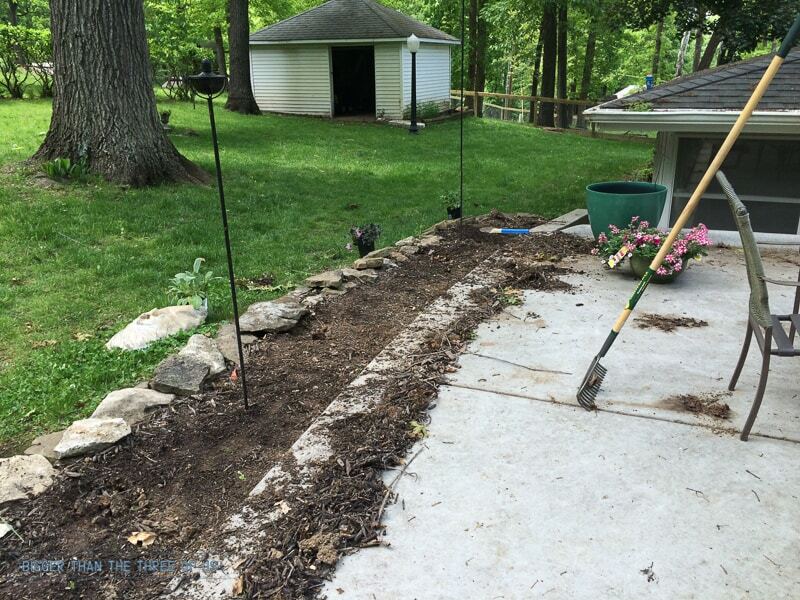 So, let’s chat about our decision for using rocks instead of mulch and what that entailed. Two years ago, we spruced up the patio with mulch. Actually, we spruced up all our flower beds with mulch. They all looked great and the patio was no exception. But, at over $600 in mulch to get all the areas looking nice, it was just too much. It would have been ok if that $600 lasted a few years, but really the mulch in our area needs to be done yearly. We have tons of trees on our property and on the property all around us. So, between the branches and leaves that constantly fall, we are out there with a leaf blower trying to keep the spaces cleared. Well, the leaf blower not only takes care of the leaves but it also moves the mulch around. So, about six months after we put in all that mulch – it went to looking pretty bad. Some areas in our yard can look more ‘organic’ or less manicured. 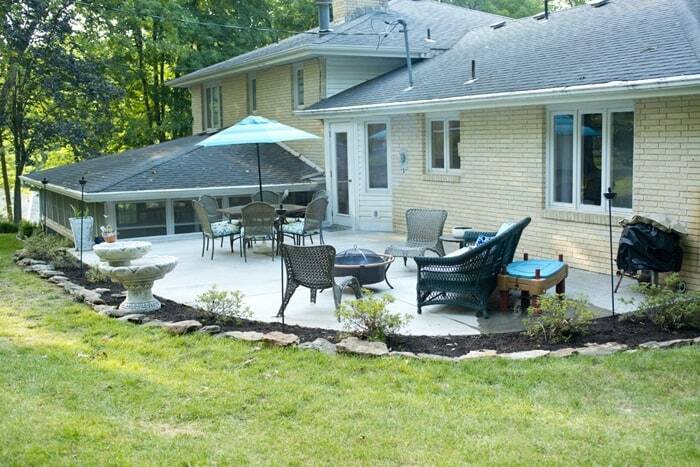 The patio area definitely pulls traditional and needs the mulch areas to look nice. 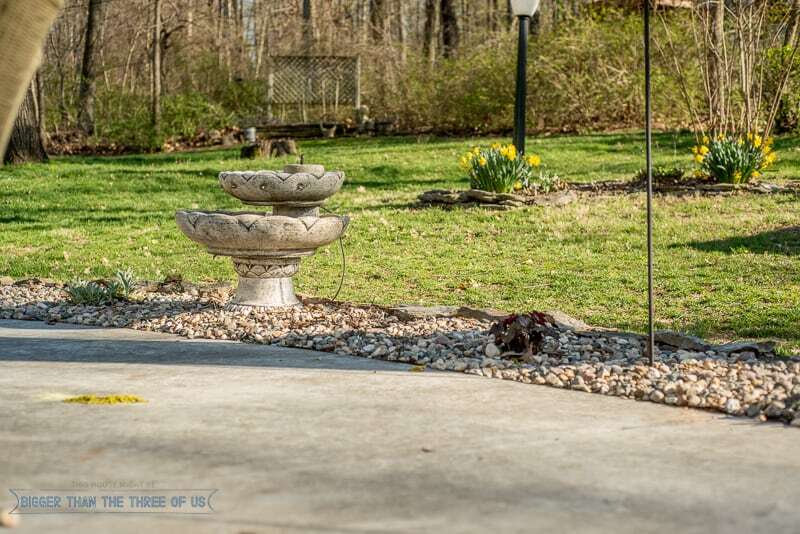 Luke and I finally came to the realization that we just couldn’t keep up with all the flower bed areas and we had to start making some changes. 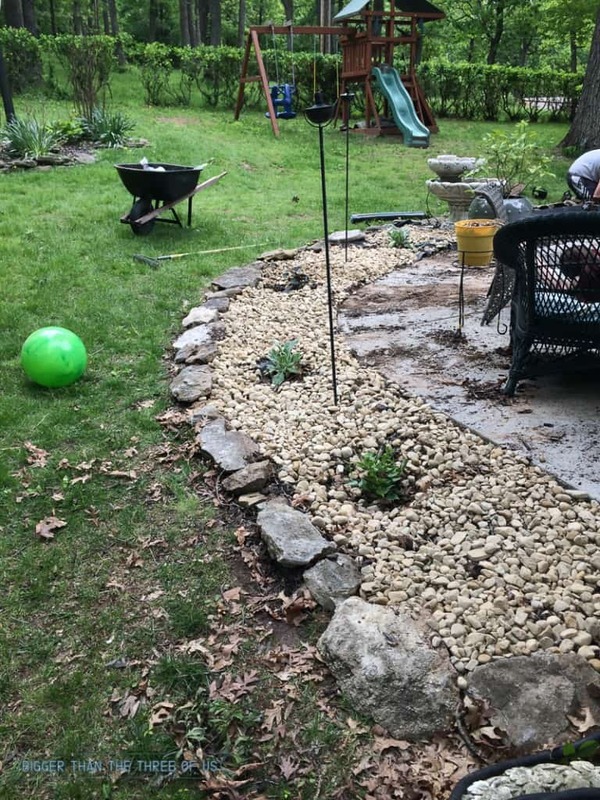 One of the changes we made was to replace all the mulch around the patio with river rocks and possibly all the flower beds with rocks instead of mulch. My step-brother and I started landscaping with rocks instead of mulch last fall and it’s been working well for us. I wanted to wait a bit to share because I wanted to give my honest opinion on the mulch vs rock look. I felt like I really needed to see how the river rock looked over time before reporting back in on the mulch vs rock around our patio. The first thing we did was to rip out all the old plants. The plants looked ok in the photo above but two of them were dead and only two had flowered (when they were all the same type of plant to begin with). So, we ripped those out and then started raking off the excess mulch. 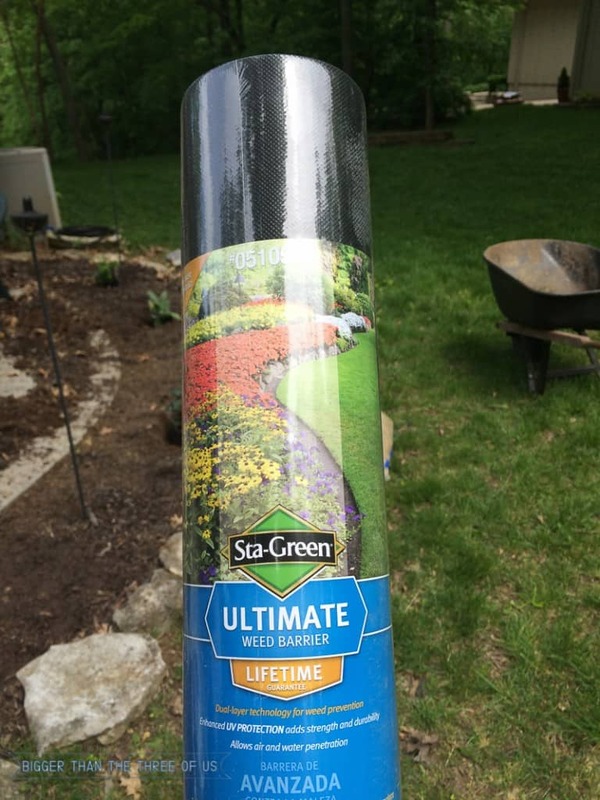 Next, we put down weed barrier. 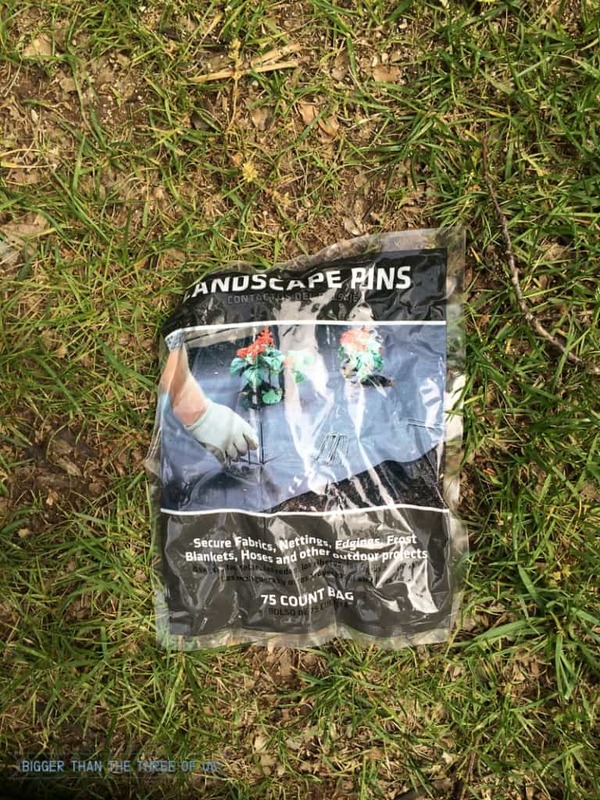 Every twelve inches or so, I would hammer in these landscaping pins to keep the weed barrier in place. 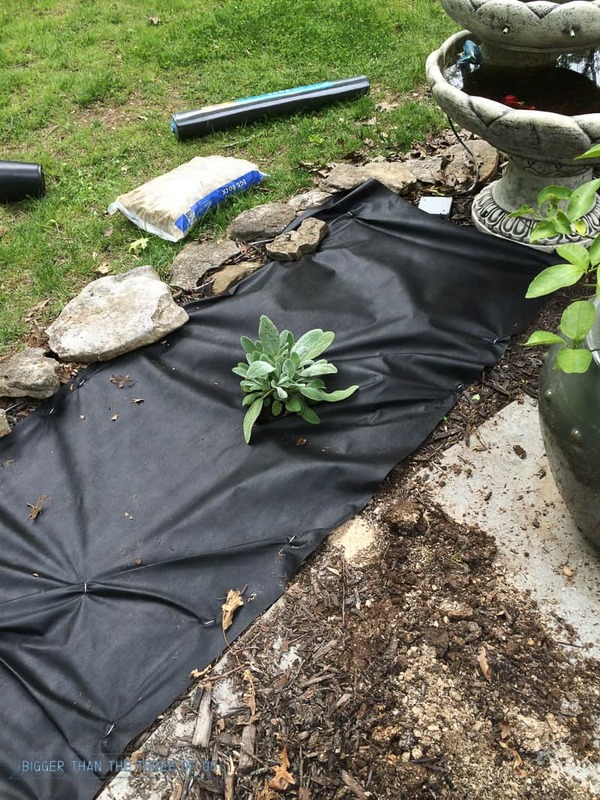 Then, I’d cut a hole in the weed barrier and dig my holes for the plants. This might seem like a lot of work but since I was replacing the mulch around the patio anyways, I wanted to do it right! I placed my plants in the holes and tucked some dirt in around them. Then, we hauled in lots of river rock. The landscape area around our patio is pretty large. I think it took about 20 bags of river rock. The total for this project came to around $175. In hindsight, it would have been cheaper to grab river rock by the truckload instead of the bags. I was just eye-balling the bags and we used way more than I expected to use. So, do we love it? Yes and no! I love the ease of maintaining it. We can use the leaf blower for just a few minutes and it looks great. The rocks stay in place and I don’t have to worry about them. Overall, I don’t love it quite as much as fresh mulch. I think there’s something really homey about fresh mulch that you can’t quite get with the rocks. However, as soon as fresh mulch starts looking not so fresh then I definitely don’t love that either. I do think once my plants grow to be a bit bigger, it will feel homier. Overall, we are definitely glad we chose to landscape with the rocks instead of the mulch. It has helped the patio stay cleaner and more put together and, in the long-run, it will be much cheaper. 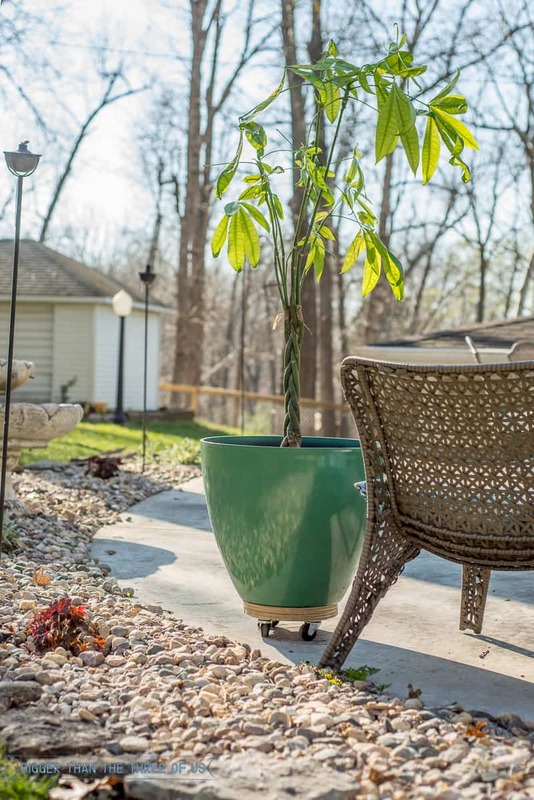 If you want to see more of our patio, then make sure to check out our home tour! What do you think of the whole rock vs mulch situation? Would you ever consider using rocks instead of mulch or do you love the fresh mulch look?